The amount of battery-powered devices such as smartphones and wearables for IoT has risen sharply in recent years. This has increased demand for smaller components that not only provide excellent design flexibility and more space for integrating new features, but also increase battery life by decreasing power consumption. To satisfy the needs of the IoT market, the company has combined its vertically integrated production system, which levers the company’s experience in evolving power components, with Nano Energy technology and has developed an ultra-low-power DC-DC converter with a current consumption of 180nA. 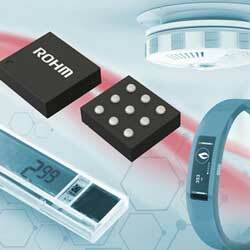 The ROHM BD70522GUL features minute dimensions of 1.76mm x 1.56mm x 0.57mm and switching frequencies of between 0MHz and 1MHz, dependant on the load. It operates with supply voltages from 2.5V to 5.5V. As output voltages, the IC supplies 1.2V, 1.5V, 1.8V, 2.0V, 2.5V, 2.8V, 3.0V, 3.2V or 3.3V. The accuracy of the output voltage is ±2% (at 10mA), the maximum output current 500mA. The operating temperature range is between -40C and +85C. The new DC-DC converter is perfect for compact battery-powered devices such as wearables, sensor nodes and other industrial equipment including alarms, electronic shelf labels and more.